Most stock varieties have become well-bred doubles, an upgrade from their single, wild nature. Modern varieties vary greatly in size but they all still have the stiff column surrounded by flowers. Stocks have a wonderful cool palette colours in pink, white, rose, red, purple and lavender. 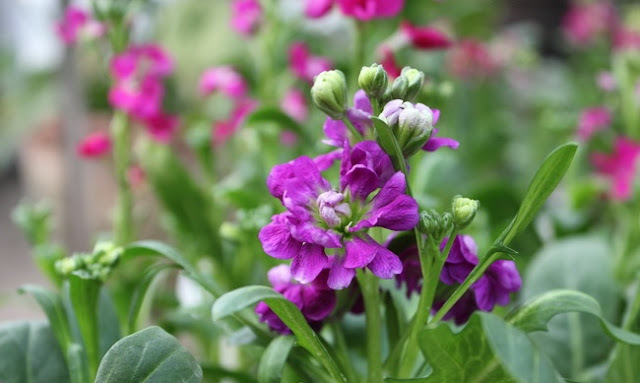 Stocks are most notably recognised for their most amazing fragrance and are evocative of childhood memories of our Grandmother, Aunt or Mother's gardens, there is just something special about them. Growing stocks here on the Coffs Coast is perhaps treated a little differently from the cool climate grown stocks. They enjoy a moist, well-drained soil high in organic matter and best grown in full sun and spaced 20-38cm apart. Seeds may be sown from March and should germinate within 10 days or so but the seeds need light to germinate so they are not covered. 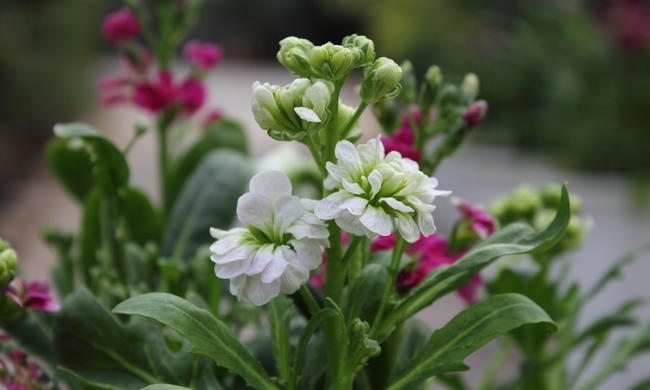 Stocks are relatively precise in their appearance and look stunning in formal beds where they can be lined up. If however, a more informal planting is desired they will mix happily with other flowers which will break up their rigidity. Terrific for containers in mixed plantings where they can be placed near to walkways where their fragrance will do their best. When choosing which variety it might best be remembered that doubles are usually the most vigorous seedlings and are often lighter in colour than the singles.